Kotobukiya’s Marvel Comics ARTFX+ Statues have brought you Earth’s Mightiest Heroes in the Avengers as well as the heroic mutants of the X-Men. 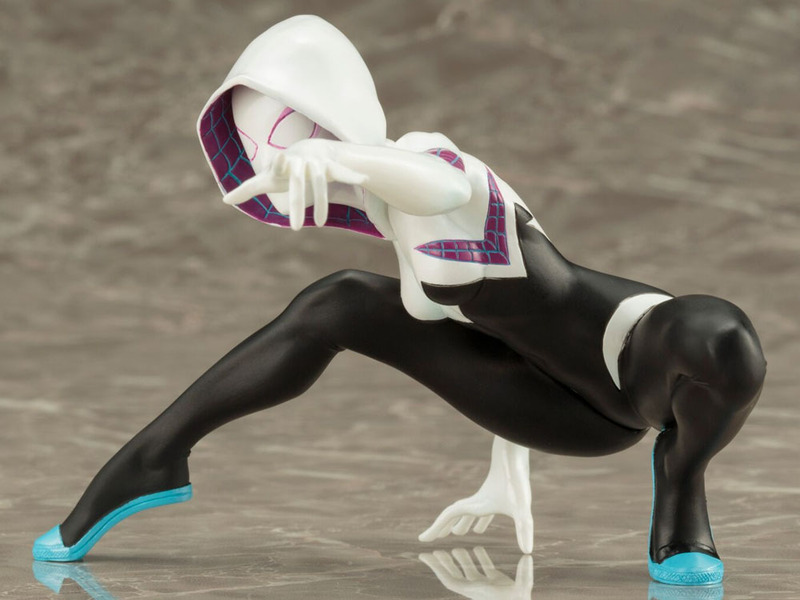 The latest series of high quality 1/10th scale ARTFX+ figures celebrates iconic characters appearing in Spider-Man titles, and following after Ultimate Spider-Man is one of the biggest breakout characters of the last few years: SPIDER-GWEN! Making her debut as part of the Spider-Verse event, this version of Gwen Stacy from a parallel Earth was bitten by the radioactive spider instead of Peter Parker. She then became the heroine known as Spider-Woman (popularly called “Spider-Gwen”), and has even crossed over with other Spider-related characters like the main continuity Peter Parker Spider-Man. And now she joins them in an amazing ARTFX+ Statue presentation based on artwork by Stefano Caselli! Defending our world and her own, Spider-Gwen drops into a deep crouch to confront her enemies. Ms. Stacy is posed in an athletic stance, balancing on the toes of both feet with her left foot tucked under her and her right leg extended. Meanwhile, her right arm provides additional support with her outstretched fingers on the ground behind her as she reaches forward in a web-shooting pose with her left hand. Of course the heroine wears the world-famous Spider-Gwen costume; it’s a black bodysuit from the torso down with white on the chest, mask, hood, and hands plus cool purple accents on her eyes and the web patterns on her torso. And Gwen wouldn’t step foot outside without her signature blue shoes! 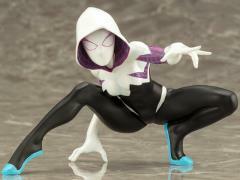 Spider-Gwen is 3 ½ inches tall (in the ARTFX+ 1/10th scale) in her extreme crouching pose and comes to you courtesy of the same sculptor responsible for the Marvel Now! Avengers, X-Men, and Spider-Man series, Junnosuke Abe. And as with all ARTFX+ releases magnets in her feet provide perfect stability on the included display base. 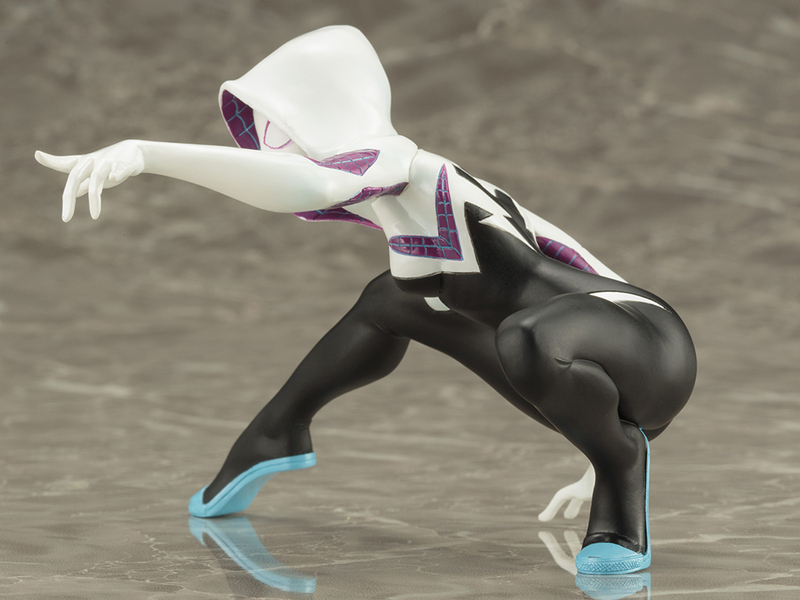 Catch Spider-Gwen while you can; she’ll make a fantastic centerpiece to your Marvel collection and will be the highlight in your Spider-Man Family series!